The University of Maine’s Jacob Schmidt-Svejstrup (right) and the University of New Hampshire’s Brendan Van Riemsdyk batle for the puck during the game in at the Alfond Arena in Orono Monday afternoon. 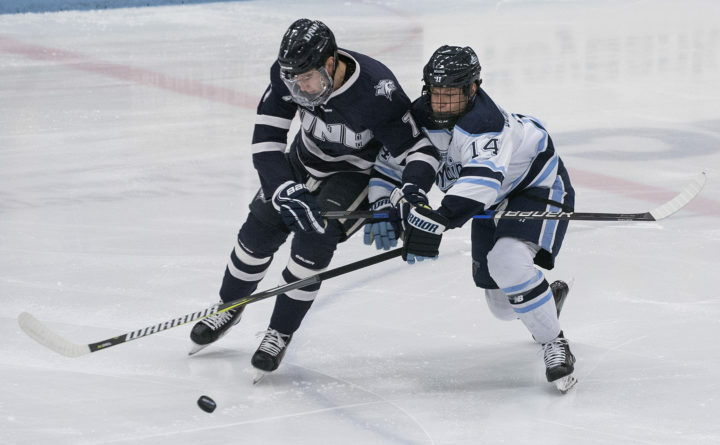 ORONO, Maine — University of Maine freshman defenseman Jakub Sirota picked an opportune time for his first collegiate goal on Monday. The Czech Republic native, playing in his fourth game after joining the Black Bears for the second semester, scored with only 1:28 remaining in regulation to enable UMaine to salvage a 4-4 Hockey East overtime tie with the University of New Hampshire in an entertaining Martin Luther King Jr. Day matinee at Alfond Arena. Jeremy Swayman made 22 saves for UMaine (8-11-3, 4-5-3 HE), and Mike Robinson had 30 for the Wildcats (8-8-7, 4-5-4 HE). UMaine, which squandered 2-0 and 3-2 leads, is now 1-5-1 in its last seven games at Alfond Arena. But the Black Bears extended their unbeaten streak vs. UNH to six games (3-0-3). On the tying goal, Swayman raced to the bench in favor of the extra attacker and Sirota took a pass at the left point from Chase Pearson. His wrist shot through heavy traffic beat Robinson over his blocker-side shoulder. “There was a guy in front of me and I saw a lane to the goal. There were a bunch of people in front so the goalie couldn’t see and I got lucky,” said Sirota. “I never saw it,” Robinson said. Sirota had a bittersweet reaction to his first goal. “I’m happy to get my first goal but it’s very sad that we didn’t win. It would have been much more satisfying,” he said. “It was an unbelievable shot,” said UMaine junior left wing Mitch Fossier, who had two assists. UMaine survived a penalty in overtime to earn a point and had a 5-1 shots-on-goal advantage in the five-minute session. The first of two Brendan Robbins goals and one by Pearson gave the Black Bears a 2-0 lead in the first period, but Liam Blackburn’s second-period 5-on-3 power-play goal and Chris Miller’s tally 2:33 into the third period tied it. Robbins scored on a breakaway 2:49 later but again the Wildcats answered with Jackson Pierson making it 3-3 with eight minutes remaining. Angus Crookshank’s goal with just 2:46 left supplied UNH with its first lead of the game but Sirota tied it 1:18 later. UNH first-year coach Mike Souza said “it was a good, old UNH-Maine hockey game. “This isn’t an easy place to get a point but I’m disappointed we didn’t get two. Neither team is going to be satisfied with a tie but it was a good tie,” he added. Robbins and Pearson scored their goals 6:37 apart. Robbins scored on a 4-on-4 as the Black Bears cycled the puck in the high slot. He got behind a UNH defenseman and directed a Fossier pass into the top corner. Pearson extended the lead by tracking down a high flip-in by Fossier and beating Robinson with a backhander from a tight angle near the extended goal line. Blackburn, a junior center, extended his points streak to 13 games by one-timing a perfect cross-ice feed from Max Gildon into a half-empty net. Miller tied it in the third period when he skated down the left wing and fired a wrister from the outer half of the left circle that evaded Swayman. Robbins skated onto a Brady Keeper pass for his breakaway goal past Robinson’s blocker. It was his third goal in his last six games after he scored one through his first 16 contests. Peirson equalized with a 20-foot wrist shot from the middle of the slot after the puck had pinballed in front off an initial shot by Ara Nazarian. Crookshank made it 4-3 when he took a pass from Blackburn, cut across the low slot and roofed a backhander from a tight angle. Keeper, Fossier and Alexis Binner notched two assists apiece for UMaine. Blackburn had a goal and an assist for UNH and has eight goals and 10 assists during his 13-game points streak. 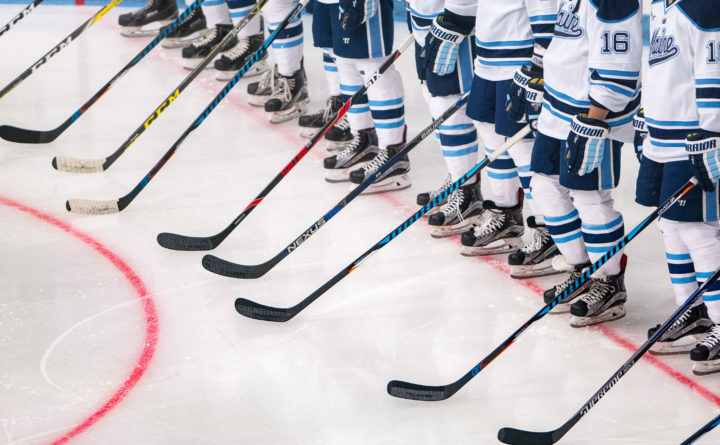 “We did some positive things but there are some things we need to do better,” said coach Red Gendron, whose Black Bears host No. 2 Massachusetts on Friday and Saturday nights.